Afraid of two things throughout her life, Clara Haskil nursed an inborn fear predominantly of playing the piano and secondly of her own mortality. It is in her playing that we became profoundly aware that time is indeed running out and at a frightening pace. That is why her performance of the third and last of Schubert's three A minor sonatas (D845) remains indelibly engraved in one's memory. Characteristically, as in so many of his works, Schubert in this tragic piece desperately attempts to arrest the passing of time. 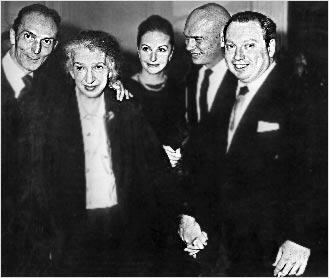 I first experienced Clara Haskil's unforgettable interpretation of the sonata in private, and later again in September 1956 when, frail and bowed and looking at least 20 years older than her 61 years, she embarked upon a memorable recital at the Besançon Festival. As she made her way across the platform, the pronounced curvature of her spine, brought on by the onslaught of scoliosis in her late teens and which had forced her to remain in plaster for four years, was very apparent. Later on I learned that before and throughout the recital she had been experiencing severe back pain and headache ? a great deal of physical discomfort, no doubt responsible for much of her anxiety that day. Headaches, the bane of her life, had pursued her mercilessly ever since 1941, after she had undergone an operation involving the removal of a tumour pressing on the optic nerve. At the time it had been necessary to smuggle a Jewish doctor from German?occupied Paris to the free zone of Marseilles in order to perform this extremely hazardous operation. 'We left Paris at night from the Gare Montparnasse, which was plunged into murky darkness, and before dawn we left the train at Angoulême. Our luggage had gone on ahead of us since as we expected to have to do a lot of walking we did not want to be heavily laden. In the sinister railway station, cold and dark, we huddled together, speaking in hushed tones; then we met the guide who was to lead us through fields and woods to the liberated zone. 'A taxi drove us to the edge of a forest, where we listened to the scarcely reassuring advice of our guide. He was obviously frightened, and told us that the prisons in the neighbourhood were full of people like us who had been caught. 'One road was especially dangerous; we had to crawl across it, for not very far away, as we could see, was a German police station. It was the end of March. The wind was cold but spring had come; there were violets in the woods and birds were singing, but we were not in a mood to enjoy that particular morning walk. On every sign?post was a skull and cross?bones and a menacing warning to anyone who ventured into this forbidden zone. Our guide wheeled his bicycle ahead of us and we followed in single file. Le Guillard carried his viola and Clara's suitcase, since she, after a night without sleep, was physically and emotionally exhausted. Each of us wore several overcoats and my wife carried our cat in its basket. Our hearts beat wildly; at last we had crossed that terrible road. I remember that at the exact moment that our cat started miaowing our guide showed us the route we should take to rejoin the railway, claimed his fee, mounted his bicycle and rode off as fast as he could. Looking back on the Besançon recital, I recall vividly Clara Haskil's extreme nervousness and anxiety, projecting to all parts of the hall. Time and time again she readjusted the height of the piano stool, as if in one final bid to postpone the dreaded beginning of the recital. After the vociferous applause died down, Beethoven's Sonata in E flat, Op 31 No 3, was executed with an overall and terrifying urgency, such as I have never heard before nor expect to hear again. In particular the Scherzo in 2/4 (conceived with gallows humour and relentless forward drive) and the presto con fuoco tarantella last movement (following a most serenely played menuetto) had the audience sitting on the edge of their seats, a near enough impossible feat to accomplish, considering Haskil's debilitated physical condition. After the interval we were to hear the Schubert sonata previously mentioned, followed by Schumann's Kinderszenen to end the programme, a work attesting once more to Haskil's rare capacity to identify completely with her subject, this time the elusive and magical world of the child. For the first encore, Haskil offered an electrifying and appropriately very Spanish?sounding account of a Scarlatti sonata in E flat. evoking Flamenco?like strains and rhythms reminding us that despite being Italian born, Scarlatti practically composed all of his 550 and more keyboard sonatas on the Iberian peninsula. This inherent Spanishness and ability to play such music was in Haskil's blood. Forced to leave Spain at the time of the Inquisition. Haskil's Jewish ancestors had fled to Salonica and via Turkey had finally settled in Romania, where she was born in Bucharest on 7 January 1985. She was the second of three sisters, the others being Lili, who played the piano and Jeanne, who played the violin. When asked about their playing, these devoted sisters would reply: 'We have talent, but Clara has genius'. Both parents were extremely musical. They named Clara after her aunt Clara Moscona, a prodigiously talented pianist who, aged 18, received first prize at the Bucharest Conservatoire, remarkable considering she had not started to play the piano until she was 14. Clara Moscona's progress was swift, but her life was tragically cut short when she died, aged 20, of tuberculosis. She had never been in possession of her own piano. In 1905 she was accepted at the Paris Conservatoire and joined Alfred Cortot's class in 1907, graduating, aged 15, with the 'premier prix'. Her second and last encore in the Besançon recital, the 'Abschied' from Schumann's Waldszenen, proved to be infinitely moving. However, it is her performance of the Schubert sonata which still haunts me after almost 40 years. Although the Besançon recital is preserved to disc, it goes without saying that no recording really succeeds in rendering full justice to such consummate musical experiences. And, however grateful one must be for the existence of such historical material, the sad fact remains that rarely, if ever, do recordings manage to capture the essential magic of the performer's art. Clara Haskil's performances in the concert hall often as not have been described as miracles, and miracles simply cannot be repeated. In years to come, I was to hear Haskil on many occasions. For these unique experiences I count myself indeed fortunate and remain eternally grateful.